Take on every challenge in the TYR Men’s Victorious Racer Swimsuit. Designed for today’s athlete, the RVICT7A boasts a 100% polyester construction, making it nearly 20 times stronger than traditional swimwear. So, whether your training takes you to the pool or the beach, you can be sure TYR’s Durafast One® fabrication will provide both a secure fit and fade-free color. 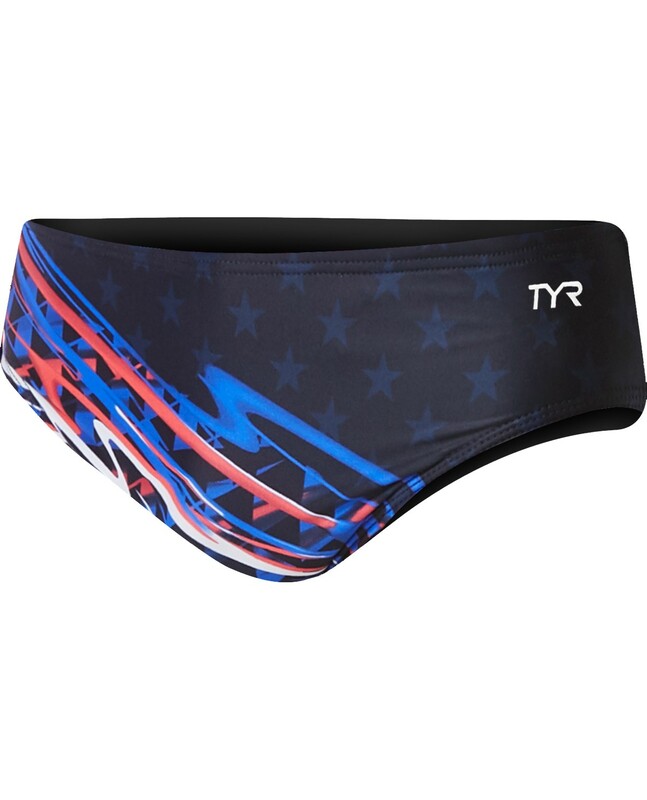 Featuring a fitted brief style, adjustable drawcord waist and bold print, the TYR racer is ideal for athletes who want a combination of minimal coverage and comfortable support during every swim. Excellent design incorporating the red, white, and blue! The suit's back panel shaded star pattern completes the look. The fit is just a bit tight, but as with every suit I have worn, it'll quickly begin to loosen up after just a few workouts. Overall it sits at four to five stars considering performance, comfort/fit, and durability. I kicked it up to five stars just because of the USA themed design...very well done! Great quality, good looks, comfortable. Got a few compliments on it already.